(Excluding "lost motion - limited back stroke" machines). The distance between the end of the plunger stroke, and the cylinder head, plus the volume in the suction and discharge check valve pockets, are together, less than a quarter of the dead volume of a diaphragm head pump, 1/4th the inefficiency of a diaphragm head. Because of this high efficiency of plunger pumps, the liquid is accelerated progressively, prevents pressure shocks, & provides ides a smoother flow. An extruder producing foam insulation for pipe cover, needs a constant feed of foaming agent. This is like a refrigerant. These foaming liquids are highly compressible, and despite the high efficiency of plunger pumps, in general, it is necessary to intercept the decompression shock wave with a "flow through" PipeHugger. 1) Provide flow thru. In place flushability for extruder flush cycle. 2) Intercept pressure transients @ 1300 Meters/Sec & 180Hz. 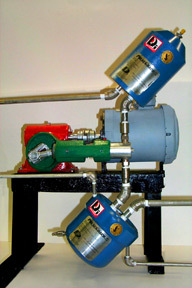 A separate connection, in and out, "flow-through", PipeHugger 70 times the volume of one stroke of the pump, rated at 2250psi (150 Bar) 3/8" pump connection & 1/8" system connection, available off the shelf. Instead of being over excited at its natural frequency of 90 Hz. 2) The ratio of damper inlet hole size to damper internal diameter is in excess to 1:6. The residue of the pressure wave is prevented from escaping from the outlet by the even higher "convergence coefficient"
The right size of pipe, small enough to be "dissipative", does as much to stabilize flow fluctuations, and reduce pressure pulsation, & prevent resonance, as is achieved with "dampers", and smaller pipe costs less.